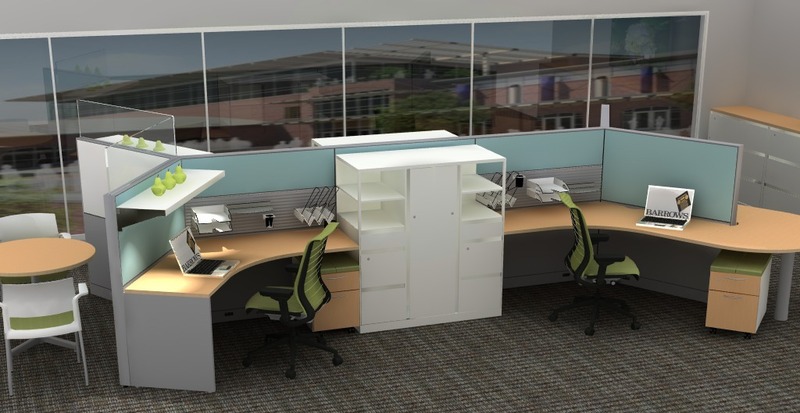 Barrows interior design team designs and specifies, then creates CAD drawings addressing workstation plans, furniture floor plans, interior material selection, custom cabinetry, lighting and other accessories. We work in concert with your architectural and design firm, providing supplemental services as needed. Our design team brings to the table a fresh, creative approach to ensure your complete satisfaction. We put a face on everything we know about the organization, the end user and the space. We convert two-dimensional knowledge into a three-dimensional vision using the newest state-of-the-art rendering software. For many, this is the most gratifying and the most fun part of the evolution of the work environment. If work space is not comfortable and functional for those performing the tasks, the job is not complete. The aesthetic value of space is enhanced by the colors, textures, lighting and acoustic considerations. Many factors must be considered in order to meet specific needs – including cost, availability and reliability. Steelcase is our calling card, but we also work with more than 300 other manufacturers of furniture, wall coverings, window treatments, cabinetry and floor coverings. No matter the size or complexity of the project, we can provide full range of solutions in one package. Before installation, we measure the plan and its specifications against the objectives and test it for functionality. We make sure the aesthetic value will have a positive impact on the organization’s bottom line.